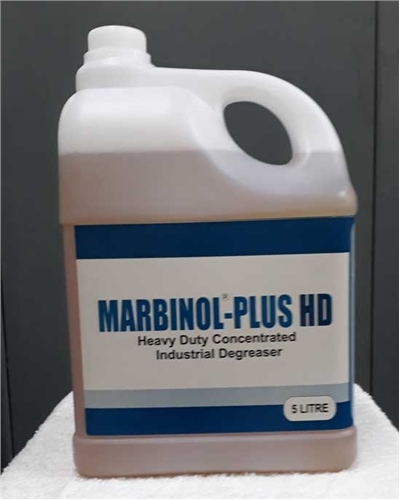 MARBINOL-PLUS HD is a highly concentrated floor cleaner and degreaser containing a blend of surfactants and non-caustic alkalis to remove grease, oil and other types of stubborn grime from a variety of surfaces. Safe to use on any hard surfaces. Leaves surfaces clean with a pleasant fragrance. Dilute 6-7 ml. per liter of water. • Spray, mop or sponge on to hard surfaces like concrete, plastic, metals and rubber. Scrub the surface before hosing away. • Dilute 20m1 in I liter of water • Scrub surface leave for some time and then rinse off. • Dilute upto 90-100 m1 of water • Spray, sponge, scrub the surface. Leave for some time agitate if necessary and rinse off with water. • Quickly remove grease, dirt & grime with minimum effort. • Can be applied with spray or immersion technique. • Non caustic, non-acidic, solvent free & nonflammable. • Highly effective for engine degreasing, plant & machinery concrete floors.